Changes to the solar feed in tariff incentives means it is important to make the most of the energy you are producing. Solar energy is obviously produced during daylight hours when the sun is shining and for the majority of people their energy consumption is lowest during this period. As energy prices, particularly electricity, continue to increase it is imperative to store the energy your system has created so that you don’t have to purchase electricity from one of the utilities. The X-Hybrid Solar System is an excellent, affordable way to benefit from the solar energy you have produced. 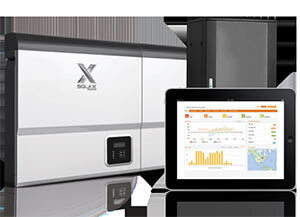 The innovative X-Hybrid is much more than just an inverter. It is an integrated system that efficiently manages the energy generated and effectively stores the surplus in batteries for later use. In a standard solar powered property only 25% of the energy produced will be used by the household, the rest gets exported to the national grid. This ‘self use’ can be increased to more than 80% by installing an X-Hybrid Solar System. We are qualified and approved installers of the X-Hybrid Solar System, please call 0800 160 1989 or Mobile: 07717 861 989 for more information.